Scott Morgan is the first registered mutant to graduate from the University of Missouri’s MFA program in creative writing. While masquerading as a normal human, Scott received his bachelors’ degree in English from the same institution. He currently lives in Fenton, MO, where his wife and two children function as a cover identity while he spies on all humanity for GWAR. Somehow, miraculously, Scott has poems appearing or forthcoming in Bellerive, Tar River Poetry and others. Light shoots through this poem, but not the easy, pleasant light of a spring graduation day. 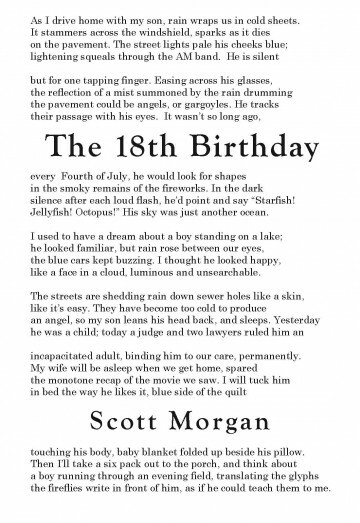 Instead, Morgan gives us difficult, explosive “lightening [that] squeals” through the car radio and the “smoky remains of fireworks.” These are violent flashes in the night, made beautiful by a father’s view through his son’s eyes: angels in steamy rain, sea creatures in the sky. The tension between dark and sudden light makes palpable the difficulties of the relationship. These two inhabit different worlds within this world, and the work of translation will always be necessary. By the time the speaker heads out to the porch with a six pack, the weight of it all – the future as well as the past – is almost too much. There seems to be only darkness. But like many parents are inclined to do when their child reaches adulthood, this father reaches for another image – because memories are bound to images just as children are bound to their parents – and he is careful to make it another image of light, to leave us with both the beauty of the possibility of translation and the gulf that makes translation necessary. This rite of passage is hard won. This poem fills almost all the available space on a 5 ½ x 8 inch card, so the poem’s overall heaviness would be apparent in any typeface. The tenderness of the speaker, though, is important so the typeface couldn’t be a heavy one. Century Schoolbook has thin enough strokes that even a solid block of it lets plenty of white space through, appropriate for a poem that ends with the glyphs of fireflies. The title has a different function: it’s both the occasion of the poem and its anchor. It therefore belonged within the body, along with the poet, who has given a voice to a difficult family transition and a complicated kind of love.